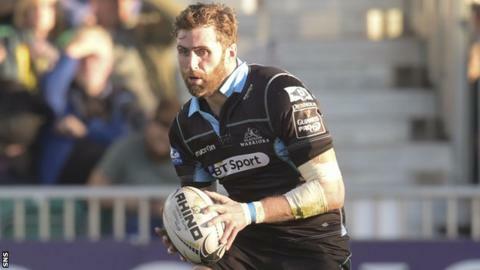 Glasgow Warriors centre Richie Vernon has signed a new deal to stay with the Pro12 side until May 2017. Vernon, 28, in his second spell at Warriors, rejoined Glasgow from Sale Sharks in 2013 but has had injury problems this season. He has been capped 24 times for Scotland and previously played in the back row for club and country. "Glasgow Warriors is a great club, which I really enjoy being a part of," Vernon told Glasgow's website. "It's been a frustrating season for me with injury, but now my shoulder is feeling better I'll be happy to get back and progress next season. "One of my goals is to get back involved in the Scotland set-up and I believe I have the best chance of doing that at Glasgow." Vernon started his professional career at the now defunct Border Reivers. And Warriors head coach Gregor Townsend added: "We're delighted Richie has signed with us for another 12 months and also that he's nearing a return to full fitness. "He played a lot of games for us on our way to winning the Pro12 last season and we're looking forward to him being available to play again and competing for a place in the team. "He is an influential and highly respected player within our squad and it's great that he is going to continue his career at Scotstoun."